One of the most frustrating things to happen while working on vehicles or old furniture is having a rusted screw or bolt snap while trying to remove it. For the average DIYer, this creates all sorts of problems if they weren’t prepared. Thankfully, having a good extractor set is all you need to keep your project rolling smoothly. But just what is an extractor and which type should you choose? The best screw extractor (or bolt extractor) might be different for everyone depending on what needs to be done. There are different types of screw and bolt extractors which use slightly different methods of getting the job done. See below for our top picks. In case you haven’t heard of Hanson before, they’re a company under the Irwin Tools umbrella that create high quality tools for both Irwin and Snap-On brands. 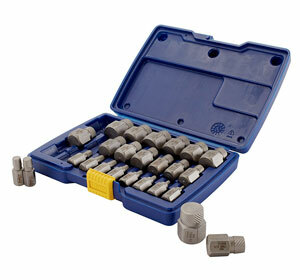 This 25-piece set is a perfect example of Hanson quality, with Easy-Out technology and a left-hand spiral design for superior gripping power to remove broken bolts, screws, and studs. 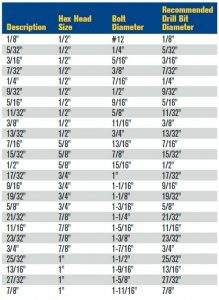 Each spline extractor has the size and recommended drill bit size etched on for quick reference, and screw extractor sizes range from 1/8 to 7/8 inches. A heavy-duty carrying case is included to help ensure a longer life for your extractors. Mechanics have used these extractors for seemingly impossible tasks with excellent results. They note that this is one of the best screw extractor sets on the market, and the multiple sizes allow for this kit to tackle most screw extraction tasks. Users note that the case is great for storage, but requires a bit of padding inside the lid to prevent your extractors from being bounced around during transit. There have been some quality control issues brought up by consumers, suggesting they have received used tools. These complaints include bent extractors and tips that break easily. Checking your tools for signs of use upon arrival is always important when not buying direct from the manufacturer. Made of high quality carbon steel, these pliers have a concave jaw design with both horizontal and vertical serrations that makes gripping nearly any screw easier. It works on both regular and tamper-resistant heads, including those screws and bolts damaged by rust. Elastomer ergonomic hand grips make using this tool easier, while the overall design can fit into tight spaces. The serrated grip makes this tool an excellent choice for broken bolt shafts as well as any damaged screw you run across. These pliers have helped quite a few users out of tough jams. Their ability to grasp recessed heads and firmly grip even tightly lodged screws with ease make this a perfect stripped screw remover. Experienced craftsmen have noted the jaws will degrade after extended use on even the best pliers, and you get back several times what you spent by the time your Vampliers need replacement. There have been some complaints about the serrated jaws wearing out soon after purchase. What causes this is unknown, as the majority of consumers claim the serrations are highly durable. This issue might be caused by receiving a knockoff product as copycats are known to target popular tools. As long as you purchase from a reputable seller, you shouldn’t have to worry about that. 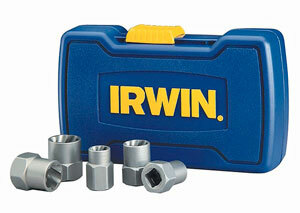 The second Irwin Tools entry on this list, this is the perfect bolt extractor starter set. The 5 pieces in this set will remove a stripped bolt of numerous sizes (11mm, 14mm, 16mm, 3/8 inch, 7/16 inch, 9/16 inch, and 5/8 inch) with minimal effort using a 3/8 inch drive. Made of high carbon steel for superior durability, these extractors have reverse spiral flutes designed to bite into a rounded bolt head for amazing grip power on even painted or rusted fasteners. 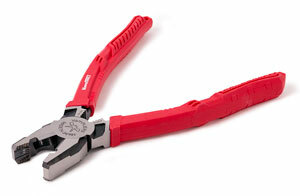 Best of all, while these are primarily a bolt removal tool, they can be used on other types of fasteners as well. The majority of those who own this set will tell you that it’s the best bolt extractor starter kit out there. They have used these extractor sockets on a wide range of problem bolts, including some that could have led to very expensive repair bills. One bonus that owners of this kit like is the five extra slots in the carrying case, allowing you to expand your starter collection without needing a separate case, although a nine-piece set is also available for those who need a wider range of sizes immediately. Some users have had issues using this set, most notably a problem with the extractor causing further damage to a rounded head. It is unknown whether this is a user error or a problem which happens under specific circumstances, however. The popular Easy Out 4-piece spiral screw extractor set is made from hardened steel for extra durability. Using a 2-step process (drill and remove), this small screw extractor kit will make quick work of most broken, damaged, or stripped screws. The four extractor bits are compatible with any drill or screw size, making this the only set you’ll need for most fastener issues. Long-term users of this set report a high degree of success with this set, often purchasing it to replace a previous extractor set that had worn out or broken. They like the compact size, which allows them to carry it in a pocket or with their drill. These users also state that the bits have a good lifespan if used properly. For the price, the Easy Out is a great value. Several consumers have had issues with the bits breaking during extraction. A few have noted this happens even when applying low torque. One user initially had the same issue, but reported success after changing how the studs were being drilled. After using this durable, adjustable extractor, you might wonder if the company wasn’t just named after a god of war, but may be employing him! The extractor easily grabs onto 1/4 to 1/2 inch studs, regardless of their condition. Made of high-grade heat-treated alloy steel with a chrome finish to protect it from rust or damage while looking good, the tool is compatible with both 3/8 inch drives and most wrenches. The design allows it to grip studs without having to first figure out the size. Best of all, Ares offers a full performance assurance to ensure this tool always lives up to its name. Owners of this tool frequently tell stories of how the 70016 easily defeated difficult studs and damaged bolts. They note that the design allows it to grab studs with smaller degrees of exposed metal the smaller the stud size. While its thickness may restrict your usage in tight spaces, long-time owners point to the durability and long lifespan as a fair trade-off. 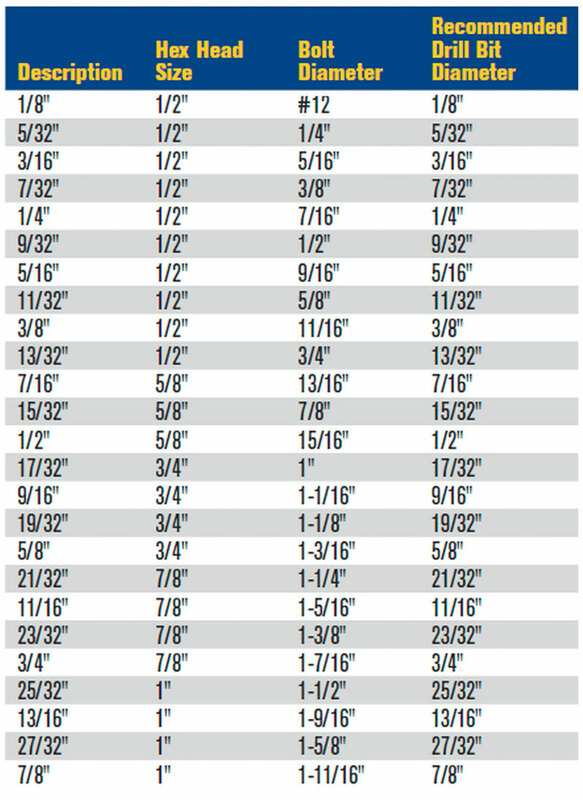 Most issues regarding the 70016 are size-related. The body is beefy, making it difficult to fit in some tight spaces. Additionally, some bolt heads will be too big to fit the tool over. It should also be noted that while the extractor can grip 1/4 inch studs, it will not grip 6mm studs, as the 1/4 inches is equal to 6-1/3 mm. An extractor is an odd-looking tool that grips onto broken bolts and screws, allowing you to safely remove them with minimal damage to the material they’re embedded in. Here are the 5 most common types of bolt and screw extractors. Stud extractors are a special fitting that can be used on most drills and drives. They come in both a cylindrical and cone shape. Simply attach one end to the drive and push the other end over your stud. The cone can be adjusted for a better grip, although the cylinder will need to be properly sized. Once the took has locked down on your exposed stud, simply unscrew or twist it loose. At first glance, these resemble regular sockets. However, the inner edges are rounded instead of straight and have spiral teeth on the inside. The perfect tool for removing bolts where the heads have been badly rounded, they are extremely simple to use. To remove the bolt, simply attach the extractor to a ratchet and place over the damaged head. You can tap it on using a hammer or wrench as well. Then, simply turn the wrench to unscrew your bolt. A hex top on the extractor makes it easy to use a wrench instead of a ratchet. Once removed, you will need to use a center punch to knock the bolt out of the extractor. This sub-group of pliers come in a variety of shapes, from seemingly normal looking pliers to tongs. They’re best used when the screw or bolt is sticking slightly out, as the tool needs something to grip. It is then used to unscrew or pull the broken fastener from its hole. Spline screws are screws with multiple points (or splines) in the head, and generally resemble recessed stars. 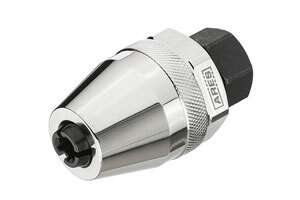 More compact than spiral screw extractors, these socket-compatible extractor heads are short and function the same as their longer siblings using a ratchet to fit into tighter spaces. These extractors resemble drill bits and are used for screws that are broken or stripped. The thread should run in the opposite direction as the screw’s threads. Affix the extractor to a tap wrench and insert it into the freshly drilled hole. Turn counterclockwise until it no longer turns, then continue to tighten with a wrench until the screw pops loose. Extract by pulling the screw out with pliers. When using a screw extractor, you will need to prepare the bolt, screw, or stud. This involves placing a center punch in the middle of the head (or shaft, if the heads broken off) and gently tapping a divot for the extractor to follow. Apply a drop of thread cutting oil (you can also use WD-40) to the screw or bolt for lubrication. Using a drill bit one size smaller than the screw, gently drill between ⅛ and ¼ inch down into the screw shaft. Be careful not to go off-center or use too much pressure. The resulting hole should be big enough for the tip of the extractor to fit into. Safety Note: You should always wear safety goggles whenever extracting, as there is a risk of metal shards flying into your eyes during the process.